Book Review: Flash Burnout by L.K. Madigan - Book.Blog.Bake. Blake is a relatively normal fifteen-year-old boy. His parents are supportive and encouraging, even if their jobs make their home life a little depressing at times(Blake’s mother is a hospital chaplain and his father is a medical examiner), he has a girlfriend whom he loves and has a good relationship with, and overall, is doing pretty well. As part of an assignment for a photography class, Blake takes a picture of a random addict on the street–only when he shows the picture to his photography classmate and friend, Marissa, she confesses that it’s her long-lost mother. And so begins the bumpy ride for Blake, who knows he needs to support Marissa, but also has trouble giving his girlfriend the care she deserves as he tries to balance them both. On Goodreads, I have a shelf called “Good Books. . . Just not sure I Like.” This shelf was made for books like Flash Burnout. This is a really good book, and if I was judging on writing alone and removing all my own biases, this would be a 5 star book. Since, however, this is my blog and I can be as biased or unbiased, as emotional or unemotional as I want in my reviews, it’s slightly less than the highest rating available. However, I did want to state up front that I think this is a well-done book. By far the best part of Flash Burnout is the voice. I don’t know how L.K. Madigan accomplished it, but she really got into the head of Blake and his narration is spot-on. I am not nor have ever been a teenage boy, but from my limited experience Blake’s actions and voice seem perfect for his character. I really do like male main characters, but they seem really tricky to write, even for male authors. I feel like I typically walk away from a book with a male MC feeling the character was unbalanced; they were too hormonal(John Green, I’m looking at Miles in Looking for Alaska), too intelligent(I love intelligence, but are all main characters genuises? Don’t they ever struggle? ), too distant from their families. There is none of that here. Blake does embody most of those things, but in a balanced way. Speaking of families, Blake’s family is probably one of my favorite YA families that I’ve read. His parents have some of the most depressing jobs I can think of(one is a hospital chaplain, the other is a medical examiner), but they really provide support throughout the story and there’s no case of absent parents here. They treat Blake as a teenager and not an adult who just happens to live in their household, which I found refreshing. The plot of the book wasn’t really my cup of tea, which is why this isn’t going to be an instant favorite for me any time soon. It’s well-written and well-executed, but I just didn’t like the way it played out. Purely a personal preference sort of thing. And because of that, there’s really not a whole lot left to say in this review. Final Impression: This book is one of the hardest reviews I’ve written, just because there’s a gap between how good I objectively KNOW the book is and how I feel about it. This book is supremely well-done and on it’s merit alone, would warrant a full 5 stars. However, the plot was just not something I was really interested in. The strong voice of Blake as a narrator kept me going, however. For me, this book is 3/5 stars, but I would still highly recommend it to people. 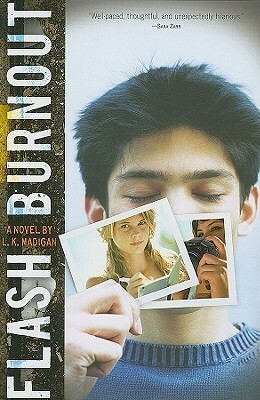 You can find Flash Burnout atAmazon or Barnes and Nobles. Book Review: The Truth About Forever by Sarah Dessen | Book.Blog.Bake. Thank you for your insightful review, Stormy. I am always pleased and honored to know when teens have read one of Lisa’s novels. It truly warms my heart. I’ve been sitting on her unpublished manuscripts for two years (Lisa passed away from complications of pancreatic cancer in February 2011), and in May I will e-publish Project Boy Next Door, a story that was written after Flash Burnout and before The Mermaid’s Mirror. The story has some recurring characters, but I’ll leave the details for the reviewers and bloggers to dish. The Sunday Wrap-up! (9) | Book.Blog.Bake. Sorry to see it didn’t work out for you all the way, but I can understand. As you said in your discussion post, a book is not just read with a blank slate. We all bring our own emotions and memories and expectations into the reading. It’s easy for one of those things to interfere with our enjoyment of a book!